an old school style digital watch, with automated colour change on the bezel, every hour, on the hour, 12 different colours. weather indicators, with the days high, current and low temperatures. battery indicators, which reduce and change from green, through orange, to red, for phone and watch, time in 24hr format and date display. 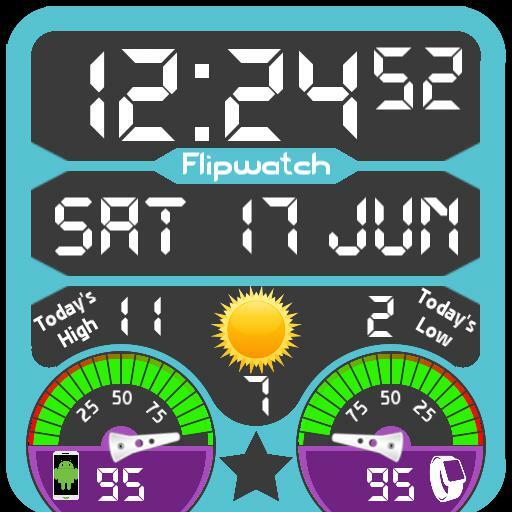 everything is created with watchmaker assets apart from the battery indicator pointers and time hands, which i got from watchawear.com but I cannot recall who made them, and the phone and watch icons, which I made myself. tap action on weather indicator to update weather. tap action on right battery indicator to dim face from 0 to 80% in 10% increments. tap action on the star at the bottom centre changes from digital to analog display.